The MICHELIN TOUGH ONE EXTREME ENDURO – Fill your vehicles, bring your wellingtons and a hat and scarf, your cameras and autograph books …Its all waiting for you…IN ULTRA HD!!! The Michelin TOUGH ONE extreme enduro takes place this coming Sunday, 27th January at Nantmawr Quarry, near Oswestry in Shropshire. Steve Ireland’s WOR Events have made the quarry a World-Famous name in the sport of extreme enduro and Steve can be credited with introducing the extreme enduro scene to the UK and with his vision and leadership the sport has flourished and grown to the point that WOR Events now run 8 big extreme events a year. Nothing is quite like the Michelin Tough one though and the atmosphere that generates in that iconic Shropshire quarry once a year when WOR produce this classic event. The 2019 edition of the Michelin Tough One is a brand-new format and it will certainly excite the riders and the spectators alike, as a fresh and new design of course and race challenge will unfold. Unlike previous Tough Ones that saw the riders complete as many laps as they could squeeze into the 2 or 3 hr duration, this years 2019 format has evolved into extreme enduro sprints, Time Trials , a series of extreme special tests… each class of ability will have a certain number of target laps to achieve … the entire lap of the course is indeed, the entire , timed to the second , challenge that awaits the hardy competitors. The usual mix of previous Tough One challenges will await the riders and the fans can expect to watch them battle over the log section, the tyre challenge…the old cars, the arctic lorry trailer and of course the super tough and demanding natural terrain that the Nantmawr Quarry will always offer. One rider per 30 seconds will set off around the track…and do their best to go as smoothly, steadily, minimum mistakes made and most importantly, AS FAST as they can go to achieve the best scores against the clock that they can. Once they have completed their target number of laps and all their scores (Test times) are collated to give an overall, aggregate score and defining result for each competitor in each class. It guarantees the spectators will get some action, thrills and spills and a much clearer view of the Tough one warriors on the course…think like this, if the previous Tough Ones where in HD then the new format and track space the riders will now have in the sprint format will be liking watching in Ultra HD!!!! A viewing feast indeed!!! If that was not enough excitement and viewing pleasure. … After the Time Trials have sorted the winners out… Steve Ireland has planned a Grand finale to the day for the lucky spectators .. The FIST FULL OF DOLLARS Super final. A 3 lap race, on a shorter mini lap of just the quarry base, with a new challenging hill climb thrown in for good measure ..for the top 6 PRO’s from the Time Trials results … The winner takes the chequered flag on completion of their 3rd lap and the fist full of cash from Race Boss, Steve Ireland. Simply a brilliant end to the day and one that will encourage all spectators to hang around and see, bar to bar banging of the best in the World and the 2019 Michelin Tough One Champion will be on that start line! Will the new format and new bike get him a 7th ?? Graham Jarvis, the King of Extreme Enduro, The current holder of the Michelin Tough One champion title from last year’s 2018 event, sits on 5 T1 wins..can he match The Knighter and get a 6th?? Jarvis is fresh from his win at last weekend’s big extreme event in France. Jonny Walker is a massive crowd puller and the Red Bull athlete is fighting back from Injury and making his presence known at the front of the results again aiming for another Tough One win to add to his previous one in 2015. Paul Bolton one of the crowd favourites, never won a Tough One but been on the podium and secured top results all over the world and is indeed riding better than he has ever before …The battling Privateer Bolts is a true legend around the extreme enduro paddocks of the World. Travis Teasdale is the young South African starlet that made a massive impression at last years Michelin Tough One with a solid Runner’s Up spot and this year on new machinery and with a new team behind him, it will be interesting to see if he can push forward and take a win at this famous event. 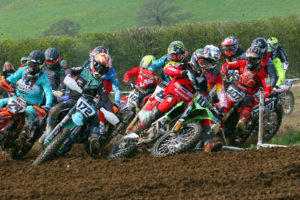 The new format will certainly also allow other pro riders like Jono Richardson, The recent Valleys’ Extreme winner, The Humphreys Brothers , Owain and Gethin, Michele Bosi from Italy, Charlie Frost, Sam Winterburn, James Dent and Grant Thomson to have a good go at doing as well in the Tough One than they ever have …And with a full entry of Expert, Clubman, Over 40’s, Over 50’s and Sportsman riders taking part throughout the day, the action is 100% certain. The Voice of motorcycling on TV and indeed the famous voice behind the Tough One microphone, Jack Burnicle will once again host the event and keep the spectators up to date with rider interviews and test time news and scores as they happen. Walking around the quarry to view at endless quality spectator vantage points is easy and you can park your car right in the quarry if early enough and settle in for a full day’s action. No pre-paid Tickets or vehicle passes are required this year – Just arrive Early to be sure not to miss the action. The PRO and Expert MAIN MICHELIN TOUGH ONE TT starts at 12.30pm. The GRAND FINALE SUPER FINAL “FIST FULL OF DOLLARS” RACE IS Approx. 4.10 pm. All are welcome and a superb day and atmosphere are 100% guaranteed … Fill your vehicles, bring your wellingtons and a hat and scarf, your cameras and autograph books …Its all waiting for you…IN ULTRA HD!! !